One of the towns that plays a minor role in the book Marcia is presently writing is Ashburton. The first time this town is mentioned in one of her books is in Starting Over for it is where Annie lives. You may remember the paragraphs in which we first meet Annie. Annie Grayshott replaced the telephone receiver and looked with distaste at her cup of cold coffee. Poor Frances had been talking for nearly half an hour and Annie felt quite numb with the effort of listening. She poured away the coffee and stood for some moments at the window, gazing out over the rooftops of Ashburton and wondering if the situation with Hugh was really as dire as Frances related. After all, Frances was not the kind of person to dramatise herself so why should she, Annie, imagine that she was exaggerating. Annie sighed and decided to take his advice. She poured herself a large whisky and stared speculatively at herself in the glass that hung beside the window. Her jaw length fair hair had a generous streaking of grey and her tanned skin was especially lined around the eyes but she might have passed for a few years less than the sixty allotted to her. One of the best reviews written about Marcia described her as “a cross between Jane Austen and Blake Edwards”. I think you will agree that the extract above confirms that view. What is quite extraordinary is that it appeared in Le Figaro. 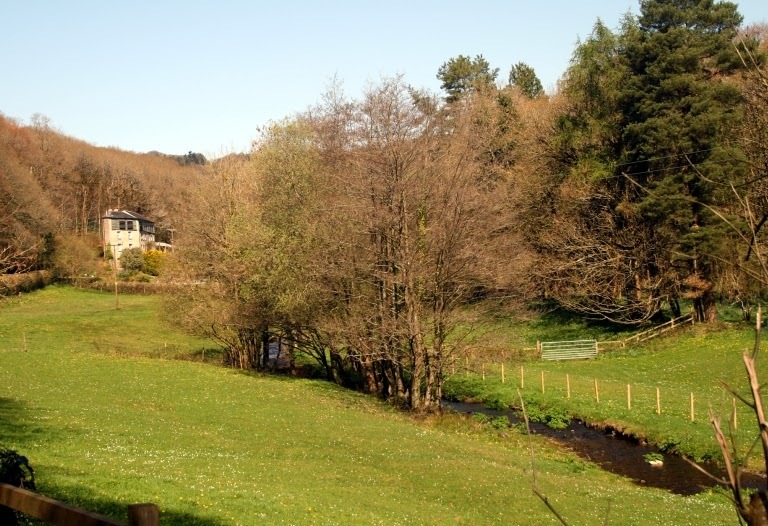 The Ashburn, having tumbled down off Dartmoor, is now winding placidly through farmland just north of the town. 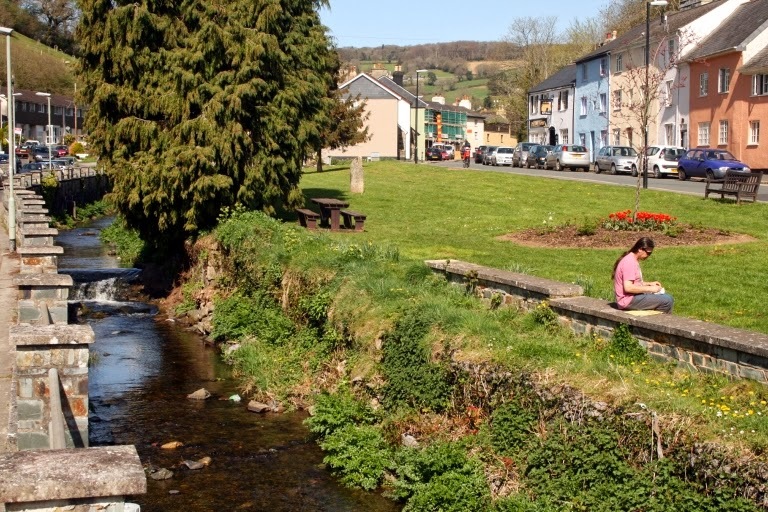 Back to Ashburton – the town on the banks of the Ash Burn. It is an old community (recorded in the Domesday Book) and was for a while an important one: situated on the main trackway from Exeter down to Cornwall and on the edge of Dartmoor it was important for the sheep and wool market and as one of the Stannary towns where tin was ‘coined’ so that the crown could levy a tax on its production. And here it is running beside the green. Placid in this photograph, like all moorland rivers it is a different matter when it is in spate. Then it fills this channel and has been known to overflow onto the green after especially heavy rain. Obviously as these two trades diminished, Ashburton became less important even though it was one of the ‘stages’ on the route from London to Plymouth. This continued to bring in trade until the arrival of the railway resulted in the demise of the highly colourful and romantic but extremely uncomfortable stage coaches. It was finally converted into a bit of a backwater when a new road was built to bypass the town (it being demonstrably not suited to much motorised through traffic) in the 1930’s. The main road running through Ashburton. You can see why it was that a by-pass was built as soon as the motor vehicle became popular. When Marcia and I lived in Avonwick we would drive up to Ashburton, buy our supper from one of the best fish and chip shops that I know and take it up onto the moor near Buckland Beacon to eat it. This became quite special when it coincided with a full moon as we could then watch it rising over the sea beyond Teignmouth. There are no modern buildings in the centre of the town and no large supermarkets. It is a delightful environment in which to do your shopping. 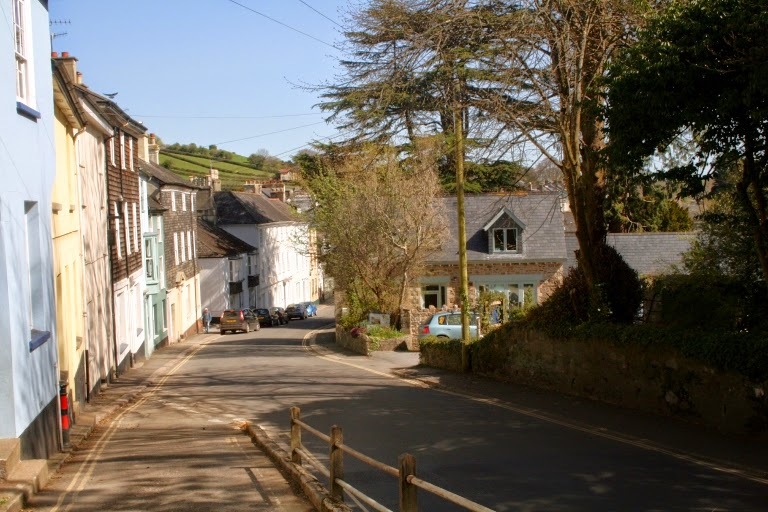 I have been thinking about Ashburton because I am researching the history of the Stannary Towns (for the “Marcia Willett’s Tavistock) which are Ashburton, Chagford, Tavistock and, later, Plympton. As the name implies, this is about tin (stannum) and the usual need of the government of the day to raise taxes on anything that moves or, indeed, does not move. 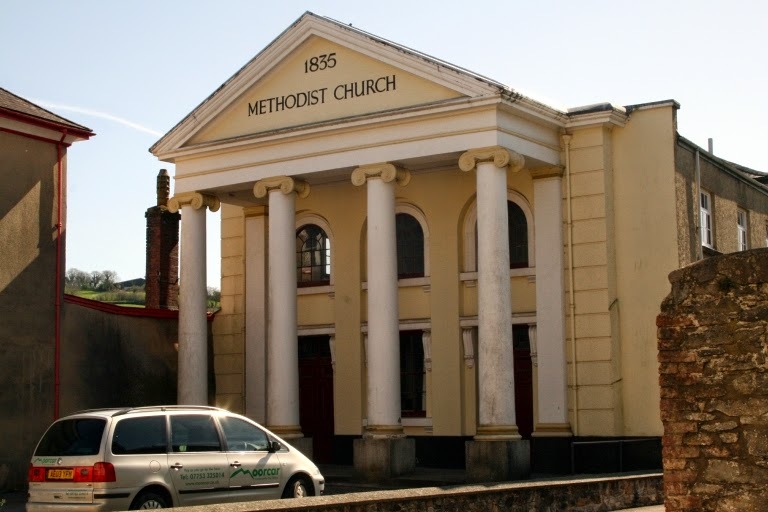 This magnificent Methodist Chapel stands as a silent witness to Ashburton's wealthy past. However, collecting taxes is expensive and the cheapest way is to get someone else to do it for you in return for something to make that worth their while. 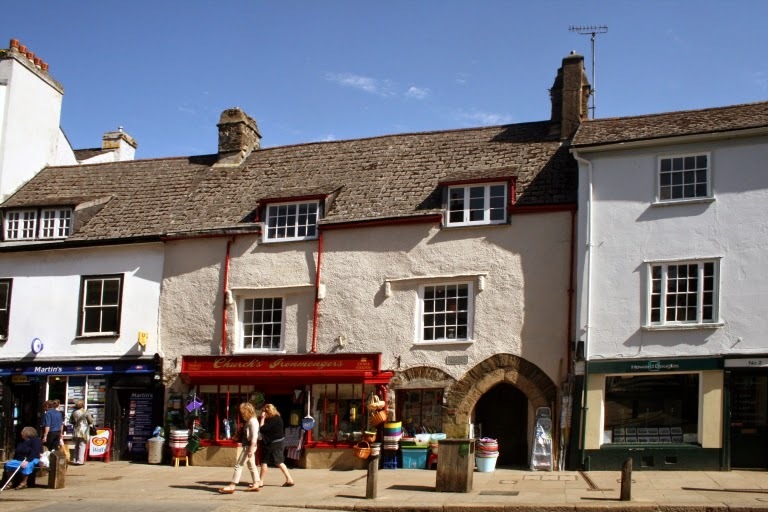 Hence in 1305 Edward I granted Stannary Charters to the first three (Plympton had to wait until 1328) whereby in return for collecting tin coinage (as the tax payable was called) these towns were granted a monopoly on all tin mining in Devon, a right to representation in The Stannary Parliament (which determined the rules and regulations which bound the tin miners) and control over The Stannary Courts (which dealt with breaches in the rules and disputes between miners). This rather suggests that tin mining here started about seven or eight hundred years ago. Far from it: tin mining was known here during the Bronze Age somewhat earlier than 2,000 BC. None of which is mentioned in the book Marcia is writing: the only connection being that one of her characters has his office in “Ashbucket” as it is often called here and hereabouts. There is a rather convoluted link that we have with Zula, seen above expectantly awaiting Christmas dinner. As some of you know, Marcia's son attended Mount House School in Tavistock which, as a result, features in some of her bools. In his day the headmaster was the late Tony Wortham who was to become a great friend after he retired. His successor was Charles Price who also became a friend and who is now also retired. 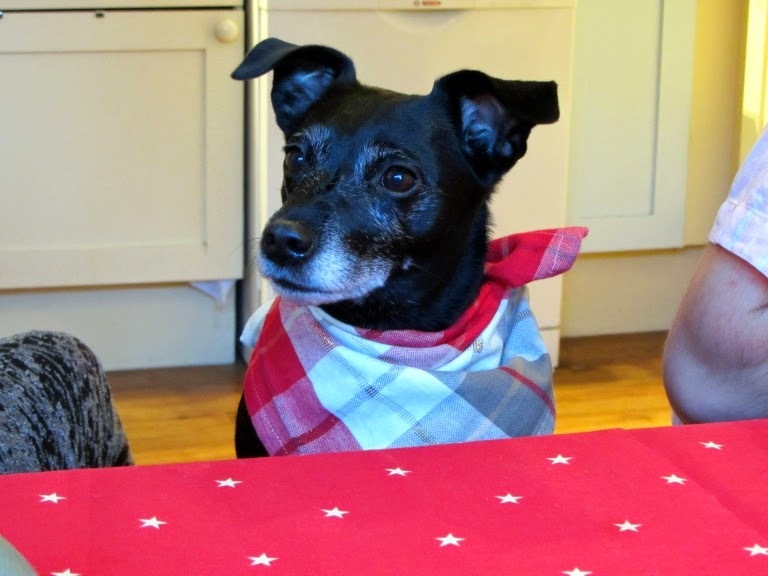 This cheeky Patterdale belongs to Charles's daughter and I am very pleased to be able to share this photo with you. Don't forget that I am always in the market for pictures of your pets.